Petofi holds office hours, and the first to arrive is Lady Kitty, convinced that he’s haunting her with a music box. He deflects the concern, but not before awakening the Josette within. Across town, Quentin asks Julia if she can put Amanda up until he can skip town. Kitty arrives and reveals that she knows full well that the “late” Barnabas was a vampire. Meanwhile, back at the mill, Aristede has returned, and the news of the new cravat he’s purchased will not distract the Count from his failure to kill Julia Hoffman. Aristede intrigues his master by pointing out that a bullet passed right through the doctor without harming her. Petofi investigates this by attempting to poison Julia, only to learn that it does nothing. Why? What he sees in 1897 is only her showing her astral projection. Her body is in 1969. Barnabas was killed because he had a body to enter in 1897. Now, Petofi needs a body in 1969 to escape. Who? After granting Beth a vision of the future, he sees that Quentin is alive and well in 1969, and will make a delightful host body. From Roger fretting about a pen to the cosmic journeys of a mop-topped sorcerer using the idiosyncrasies of time and astral projection to escape a horde of gypsies, DARK SHADOWS has completely thrown out the rules. 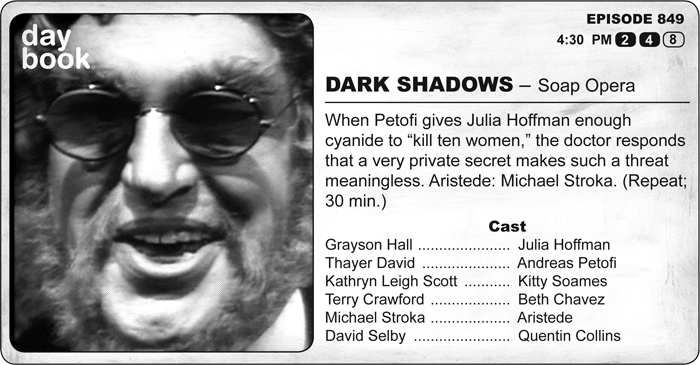 Especially with the introduction and expansion of that dark Dr. Lao, Count Petofi, I feel as if DARK SHADOWS is finally a wholly autonomous, creative universe, crafting its own myths rather than adapting those from other authors… even though THE PICTURE OF DORIAN GRAY is one of his key storylines. In a show that created a number of mostly-original characters (all of whom were improvements on their inspirations), Petofi easily stands as the wittiest and most interesting. I’m not even sure he can be called malevolent… maybe just impishly self-driven. In RPG terms, he’s Chaotic Neutral with a naughty streak as wide as Canada. I can’t be the only one who cheers him on (a little guiltily) as the Count plans to use Quentin’s hideously-dressed, 20th century body to leave 1897 far behind. And now he has Beth as a moll! This is like an episode of THE OFFICE. Side characters swirl through meetings with a boss who is completely preoccupied with other matters… until something comes up that’s too good to resist. Like body snatching! Henry Kaplan now has his second significant day in a row. Yesterday, he was born, and today, in 2005, he died at the age of 79. Also on this day in 1969, September 14 was chosen as the first military Draft Lottery date. In stories of constant, impending doom, where your body can be stolen at any point as food or fodder by powers almost beyond human reckoning, this seems both poignant and a Zeitgeisty reason the show was resonant to younger viewers (and their moms).